Peaches are at their best from mid- to late summer. Make sure to get them already almost or perfectly ripe. Rock-hard peach that have traveled a great distance never seem to develop much flavor as they ripen, and often go to mush. This quick dessert can be enjoyed shortly after you make it — no baking or chilling required! Out of season, frozen organic peaches are a good alternative to fresh. Photo by Hannah Kaminsky of Bittersweet. Combine the peaches, juice, and syrup in a skillet. Bring to a gentle simmer and cook for 5 to 8 minutes, or until the fruit is tender and the liquid thickened. The consistency will depend greatly on the juiciness of the peaches. If you find there is too much liquid in the skillet, drain it off. On the other hand, add a little more juice if the mixture needs it. 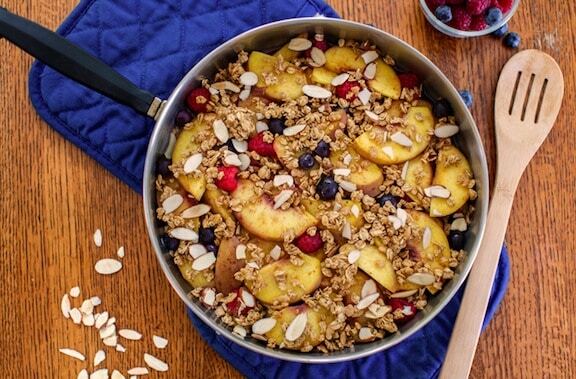 Stir in the berries and cinnamon and allow to cool in off the heat, in the skillet. 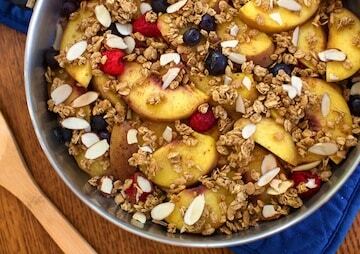 When the crisp reaches room temperature or just warm, sprinkle with the granola and optional almonds. 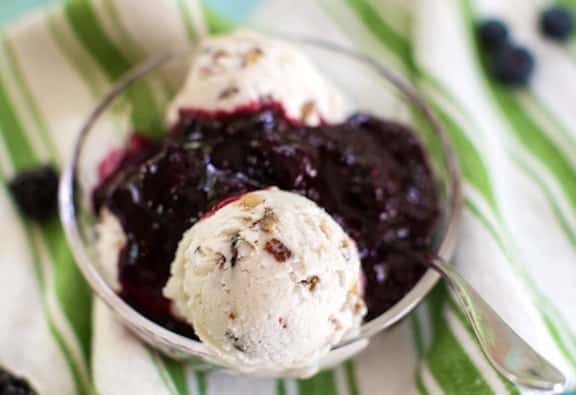 Serve at once over nondairy ice cream, if you wish, or on its own. Enjoy other No-Bake and Raw Sweets.